No matter the size of the home or the scope of the project, the finishing touch that brings it all together is almost always the introduction of greenery. There is something about adding a living element (even if its faux) that say’s “its done”! Without it the room doesn’t have any life to it, isn’t cohesive or just looks flat even though all the elements may be there. Adding greenery and plants to your home is a great way to add life and energy to it. Here are a few basic that I go by when decorating with greenery. I believe to truly feel the impact of plants in a room, you have to get them up and off the floor and into your line of sight. This can be accomplished with either tall planters or putting them on a pedestal. This works especially well in homes with high ceilings. Not only can pedestals and large planters add sculptural appeal of their own, but they can turn an otherwise boring hall-way or corner into a living, exciting point of interest. They can also be placed behind a chair or a nook next to a window. Small accent tables, étagères, and of course, traditional plant stands also make ideal platforms for potted plants. Some may think it risky to invest time, effort, and money into a large-scale plant, but the result is worth it. An indoor tree, such as a palm, a fiddle-leaf fig, or a ficus, can be the difference between a room that feels dreary and one that feels fresh and full of life. When placed near windows or French doors, indoor trees will help bolster a room’s visual connection to the outdoors, especially when its too hot or cold to spend a lot of time outside. Beyond the mental and emotional impact of all that greenery, adding a large plant to a space can really spice-up its style factor, the same way a piece of sculpture or an eye-catching light fixture does. A large plant has real presence in a room, drawing the eye up and around and adding gorgeous textures and dimensions to any room. Often times I'll turn a room or sunny corner into an indoor arboretum by adding more than one type of plant. To accomplish this I'll cluster plants in a variety of sizes, textures, and containers with some placed on the floor and others on pedestals or tables. The result is a look that feels lush and organic. A single petite plant can do wonders for a lackluster corner or a lonely hall table. But if you double it up, it just works so much better. For example, to highlight a beautiful glass, stone or chrome console table I often make a row of green potted plants in similar sizes in matching containers. This makes a wonderful yet simple centerpiece or windowsill vignette. I especially love this look when using small-scale plants, whose tailored shapes create a pleasing visual rhythm when repeated. Don’t have a green thumb or the time needed to pamper real plants? Quality faux greenery on the market today are incredibly life-like and real, and require a fraction of the time needed to maintain them. Other than light dusting from time to time, a quality faux plant or tree will last years. This is often the case with many Furniture Market clients who maintain second homes here in Las Vegas. Real greenery just would not be practical if the home is left alone for long periods of time. Faux greenery comes in every imaginable type and size, and something can be found for every need. Real succulents are really low maintenance , hardly require any water grow very slow. This makes them perfect for the out-of-town or on-the-go homeowner. The only they require a lot of is sunlight, and lots of it. Orchids are another great low maintenance plant. They’re also beautiful and require very little water, and like succulents they also need a fair amount of sunlight. Creating beautiful greenery arrangements can be as simple as opening a home design magazine or visiting your local nursery. Or, you can stop by Furniture Market and get inspired by the dozens of one-of-a-kind arrangements on display throughout the showroom. We'll be happy to assist you with recommendations and ideas. You can also take the easy route and purchase one right off the floor. Either way, going greenery can be a lot of fun. There is one common element I find in every new home I furnish, and that is the unlimited flooring possibilities the new home owner can choose from. No longer is wall-to-wall carpet the standard for rich and luxurious elegance. Stone, tile and wood is now the accepted standard, and within those three mediums, the choices are almost unlimited in regards to colors, materials and textures. With that now the norm, the popularity in area rugs has gone up dramatically, creating an entirely new focal area within a room. Area rugs have a unique way of bringing together all of the elements of a room, by pulling together various colors throughout the room and décor. But the benefits of area rugs extend far beyond style. Here are a few to consider. It’s obvious that carpet is a lot softer than hardwood or tile on your feet, and most will agree that carpet is more comfortable to stand on than that of hard surface floor. Not only does the carpet feel softer to the touch, but its softness gives it flexibility, which allows the carpet to absorb some of the impacts of your footstep. This literally takes some of the pressure off your body. An area rug will significantly decrease the noise in your room by eliminating sounds reverberating off walls and floors, especially in larger rooms. It acts as buffer by absorbing sound from the air. Lay down an area rug, and listen to the difference. Although winter temperatures in Las Vegas are rather moderate compared to many cities, it can still get rather chilly giving carpeting an advantage to hard surface flooring. An area rug placed in the center of your seating area will not only help retain some heat in that area, but it will make walking with bare feet more comfortable. A properly placed area rug will instantly anchor the furniture within a room, which in turn will create a cozy, intimate living space. I always choose a rug that is large enough so that the main pieces of furniture (sofa, love seat, chair, coffee table) are all sitting on the rug, or at minimum have the front legs on the rug. Without the rug, it can feel as though the furniture is ‘floating’ in the room. If you subscribe to feng shui or similar beliefs, or even if you just intuitively sense it, an area rug helps slow down the energy that flows through a home. In other words, its helps ground a space by providing resting place for both body and energy. Energy travels quickly over hard surfaces, creating feelings of excitability or anxiety. An area rug introduces a sense of calm into the space by slowing the energy. Be sure to choose a rug to match the space. Skimp on size, and your room will look smaller, choose one too large and you'll loose the ascetics of your hardwood or tile flooring. In a living room, the rug should define the conversation area, and be large enough so at least the front legs of the furniture are on it. Don't be afraid to layer an area rug over existing wall-to-wall carpeting. It will add playfulness while still pulling together the rooms boundaries. When I'm asked to design a room from scratch, I often choose the rug first and work my way up. After all its the biggest, most impacting piece that will tie the room together. Then I select the furniture, throw pillows, textures, and then textiles for curtains. I will often use the area rug to introduce color and contrast into the room. An interesting pattern or texture to the rug will instantly create a focal point, drawing the eye to it before moving up to the furniture and beyond. Its a wonderful way of adding color to a room designed around neutral colors and textures. Lastly, area rugs are fun! They can be changed out periodically and each time it will completely revitalize the space and feel of the room. They can even be stored and re-used again at a later date, or swapped out to a different room or space. I think of area rugs much like a persons wardrobe. Something to change to suit the mood, climate or purpose. I can't think of anything more fun and enjoyable than entertaining friends and family at home, whether it be around the Christmas Tree or out by the pool, it will always be one my favorite things to do year round. No matter the season or the reason, entertaining always entails having plenty of wine, cocktails and my favorite, those deliciously sweet and tangy frosted drinks. The only question is where and how to serve them. 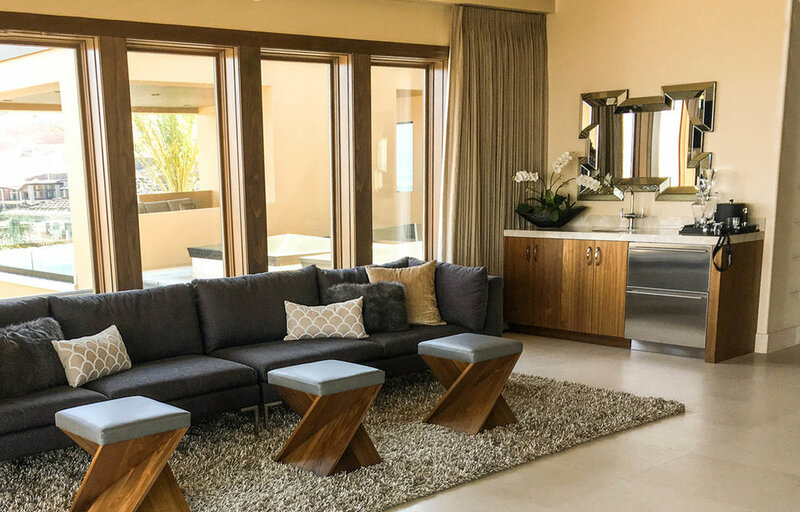 Most of the luxury homes we decorate have built-in elaborate bars with every built-in gadget and feature that would easily rival the biggest and best bars on The Strip. Others have a modest counter area set aside as a bar, other homes have nothing at all. Regardless where your home falls into the mix, creating a home bar should be next on your to do list. Lets assume that your home was not built without a dedicated bar room or an elaborate built-in bar in your family or living room. The first thing you’ll want to do is decide where to put your home bar. Common places include kitchens, dining rooms, and family rooms as people often entertain guests in those rooms. If you live in an area with great weather year-round, you could even consider an outdoor bar. If your undecided, I have solution for you as well. More often than not, all you're going to need is a little space, a near-by electrical outlet and a little imagination. Lets take a look around. Perhaps your home has a space under the stairs, or a recessed wall in the family room that us too small for a sofa ,or too far from the TV. These make perfect bar areas. Now that we found the perfect spot in your home for your new bar, the question remains whether to build it in or create something free-standing or portable. A built-in dedicated bar can be as simple as a counter with a few drawers, cabinets and a power outlet. If space permits, a small refrigerator can also be incorporated into the unit. The second option is to go portable, which would include a stand-alone freestanding bar or even a bar cart. The later has become very popular the last few years for a variety of reasons, first and foremost in that they do not take up a lot of room, and they can be wheeled outside during the nice weather. 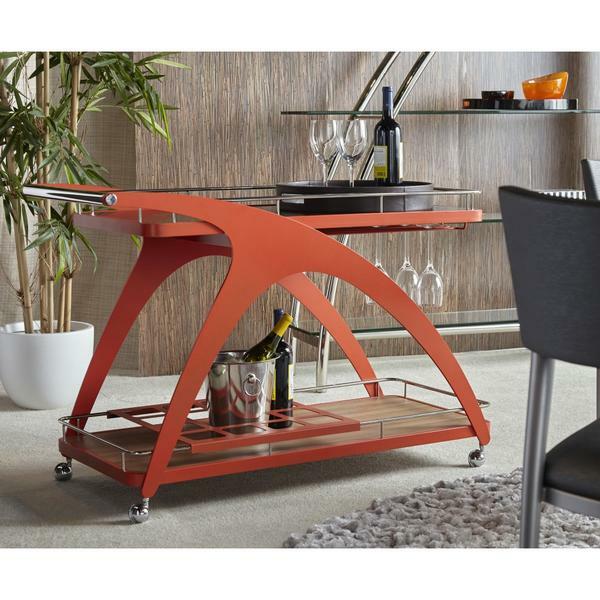 At Furniture Market we carry a great selection of portable bars and bar carts to suit every taste and budget. Using built-in cabinets or large furniture can make your bar look more distinguished and showcase your liquor, drink ware and other bar accessories. Built-in cabinets are the most expensive option, but they also give your bar the most stately, permanent look. If built-in is too big of a task, using a buffet table, cabinet or bookshelf is another way to incorporate storage in your bar and feature fun pieces of furniture. A built-in kitchen island can double as a bar and serve several purposes. Islands provide ample space for preparing and serving drinks or hors d’oeuvres at a party. With the addition of few bar stools, guests can sit at the bar and socialize. If your island has a sink which will help you clean glasses quickly and serve drinks faster, then you're ready to go. Seating is key to having guests linger in your bar area, whether with traditional bar stools or comfortable lounge seating. You want to have room for your guests to socialize comfortably; this can be as simple as adding a few vintage chairs near the bar or rearranging your space so that chairs, couches and other seating complement the bar area. If you’re going to be playing bartender, you’ll need some ice and a place to keep your beverages cold. Small refrigerators can be placed within the lower cabinetry of your buffet or console, and come in a wide variety of styles and prices. A vintage ice bucket will create a focal point on the bar as will a modern stainless steal drink mixer. Once you’ve set up your bar, complement it with great service-ware such as shakers, cocktail napkins and a variety of glasses for all types of beverages. You can spend as much or little money as you’d like doing this, ranging from matching cut-glass pieces to quirky antiques and flea-market finds. Regardless how small or elaborate your bar may be, you'll learn that having one will become the catalyst for a good social event. Last of all is a good reason to invite your friends over for an evening of fun and drinks, keeping in mind that sometimes the best reason is no reason at all. Cheers! One of the most important rooms in your home, perhaps only second to the family room, is the dining room. It's where friends, family and special guests gather to enjoy each others company and dine on a fine meal. Although good food tends to be the focal point of the gathering, the dining room itself is essential to enhancing the total dining experience. Here are the basics I go by when tasked with designing 'the perfect dining room'. This may sound simple, but its usually where people go wrong from the start. Its like the old saying of 'putting the cart before the horse'. You find a piece that you really like and then squeeze into a space hoping the room will enlarge around it. It rarely happens! For extra-small or corner spaces where you don’t do a lot of entertaining, consider a round table which is easier to navigate around and takes up less space than one with corners. For larger spaces, long rectangular tables are ideal. Many of our tables here at Furniture Market have adjustable extensions, some of which are powered and will tuck away under the table with a touch of button. Most table heights are about 28-30″, so you’ll want your chairs to be at least a few inches taller, with seat heights at about 18″. If you choose chairs that have shorter backrests they will end up looking tiny. Chairs with long angular backrests are my favorite in larger spaces with high ceilings or open floor plans. Keep in mind that tall-backed chairs are great way of separating the dining area, but can otherwise cramp a smaller room. Your lighting should likewise be sized to the room, but more importantly to the table. In general, the bottom of your light fixture should be more or less about 30″ from the table surface, although this number can go up with higher ceilings, I personally like to keep fixtures lower. When the table is long, one that seats 8 or more guests, I often select a light fixture that is long and wide, or a series of pendants in the same shape. The main rule is to ensure you have enough bulbs in your pendant or chandelier to adequately light the room in the evening, and compensate if needed by adding a lamp or two on a sideboard. Lighting operates on the same principle as scaling your furniture, the larger the room, the more light you'll need. Many of the contemporary homes I design for have beautiful wood, tile or stone floors that enhance both the light and space of the room. To add a little warmth to the room I sometimes suggest an area rug under the dining set. In this case I usually recommend choosing either the largest rug for the table, one that goes beyond the legs of the table so the chairs still sit on the rug when pushed back. This looks nice plus it helps protect your floors from scuffs! Visual contrast and textures is what brings a room alive, and creates points of interests. I like to create a contrast between tables and chairs, either of material, style, or both. A beautiful console or sideboard is an excellent space to add contrast or texture and makes a great home for a sculpture, center piece or floral arrangement. Speaking of floral arrangements, if space permits, consider a large potted tree or greenery which instantly adds life to a room. At Furniture Market these are custom made for each room, although we do keep a large assortment in stock. Wall ornaments, mirrors and artwork is also a great way of adding texture or contrast to a room. The most important consideration when designing your dining room is how exactly you’ll be using it. Will it be the place for every day meals, or will it be for holidays, special guests or occasions? Deciding its primary use is paramount when it comes to choosing materials and even which pieces of furniture are necessary for your space. If its going to be used as the later, than it will allow for more freedom when it comes to the design. There are no hard-and-fast rules when it comes to designing spaces, and if follow the basics as described above you'll be able to create a dining space that will excite and delight. As always our designers are here to assist you and answer any questions you may have.